BIG HIX know how to throw down a hoedown! The most exciting, fun, and authentic country music tribute band working today, BIG HIX perform non-stop high energy radio hits from the likes of Kenny Chesney, Luke Bryan, Miranda Lambert, Keith Urban, Carrie Underwood, Jason Aldean and today’s other arena-filling Nashville stars. Plus, by request they can deliver a totally authentic set of vintage 60s and 70s classics from the golden age of Hee Haw. 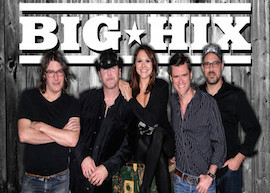 BIG HIX Americas’s Best Modern Country Tribute Band! BIG HIX is comprised of world-class professional musicians who grew up playing country music and features three dynamic lead vocalists. All seasoned professionals, the members of BIG HIX have recorded and performed with gold and platinum-selling, Billboard-charting acts such as Kanye West, Rock of Ages, Moby, Blue Man Group, Jay-Z, Fountains of Wayne, and many more. With decades of touring experience and literally tens of thousands of shows under their collective belts, BIG HIX know how to get their audiences dominating the dance floor or belly up to the bar. Simply put, if you want the best country music at your event, invite the BIG HIX!